Thanks to Daniel Kahneman’s fascinating book, “Thinking, Fast and Slow” I’ve discovered the concept of ego depletion. Coined by Roy Baumeister, the term ego depletion simply means that we have a limited pool of energy to devote to both self-control and cognitive tasks. If we devote energy to, for example, suppressing temptation, we’ll be less willing to solve a difficult math problem or run an extra lap around the track. Baumeister did a series of landmark experiments to prove the link between self-control and our willingness to engage in difficult cognitive tasks. He found that people who were asked to resist eating chocolate cookies and candy were quicker to give up on solving challenging puzzles than those who were allowed to indulge in the sweets. What the heck does this have to do with autism, you ask? A lot. The types of things Baumeister tested for are all related to executive function (EF)–our brain’s ability to regulate our cognitive processes. EF includes things like planning, problem solving, working memory, attention, and initiating, sustaining and inhibiting actions. That last part is really important–that’s where self-control enters the picture. When we look at the tasks that Baumeister asked his subjects to do, they all call on the brain’s executive function reserves. And impaired EF is a central feature of the typical autistic brain. What’s More Important: Quiet Hands or Long Division? Many therapists, teachers and other professionals believe that extinguishing a child’s stimming is necessary for learning to take place. 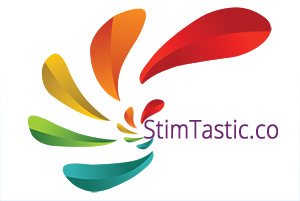 Their justification is that stimming diverts the child’s attention away from the information or task. To help the child focus, they insist on “quiet hands” or “quiet bodies.” The assumption that a child can learn better if he or she suppresses stims has been widely disputed by autistic adults and by some parents, teachers and therapists. The obvious reason for objecting to “quiet hands”-type instruction is that it shames the child for moving in a way that is natural and comforting for them. Others have written eloquently and in great depth about this subject; I’ve linked to some key pieces below rather than repeating what has already been said. The case I want to make against “quiet hands” is that in addition to being emotionally damaging, it’s cognitively counterproductive. Think back to the experiment where the people who were told to resist eating chocolate gave up more easily on solving puzzles. Substitute stimming for chocolate and learning long division for solving puzzles. Add in the fact that autistic people have impaired executive function to begin with, making inhibition of actions more challenging, and you can see why asking a child to resist stimming is counterproductive if you’d also like them to learn a new skill. To help us think about executive function in concrete terms, imagine two children in the same math class. Since we can’t actually see or measure EF in a simple way, let’s use imaginary EF “units” to talk about typical versus impaired executive function. The typical child has 100 units of EF available for math class. The child with ASD has impaired EF, meaning s/he begins the math lesson with 70 units of EF. Assume the typical child has to exert some self-discipline to attend to the math lesson: 20 EF units, which are devoted to things like staying seated, paying attention, and not talking to classmates. That leaves 80 units that can be devoted to learning math. 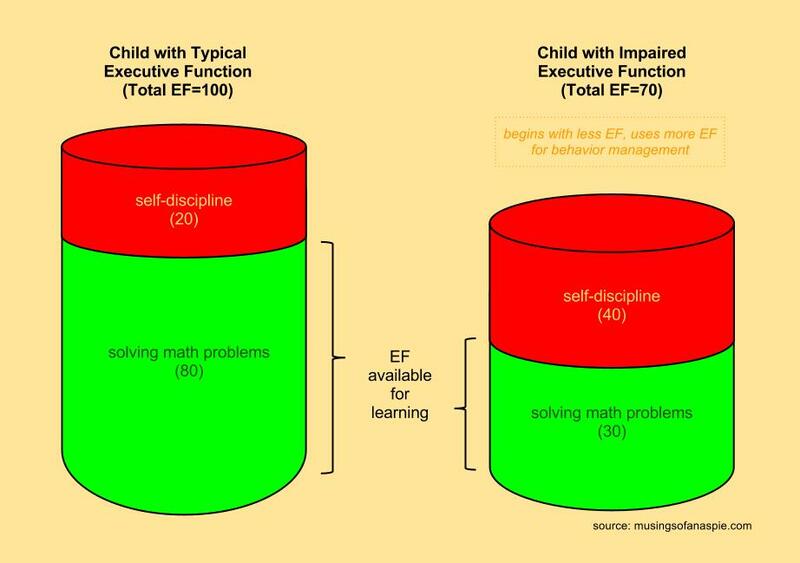 Assume the autistic child has to devote twice as much EF (40 units) to self-discipline. Not only does s/he have to do all of the things the typical child is doing (staying seated, paying attention, not talking to classmates), s/he has to inhibit the natural urge to stim. That means s/he is starting out with less EF and devoting more of that small reserve to self-discipline. Look at the amount of EF each child has left for doing their math work. The autistic child starts off at a disadvantage and is further disadvantaged by a classroom rule that has supposedly been put in place to help him or her. Before you say, “but how can s/he learn math while spinning around/headbanging/bouncing up and down” let’s clarify what stimming is. Yes, sometimes stimming is all of those things, but it is also fidgeting with a toy, chewing on a chewy, bouncing a leg/foot, flapping a hand, flexing fingers, rocking gently, moving around on an exercise ball used as a chair, or any number of other things that can be done while sitting at a desk. 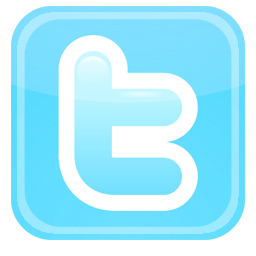 In fact, every time I stop typing to think of what I want to say next, I start rhythmically tapping my fingers in sequence on my keyboard. That’s stimming. I don’t think about it. I don’t do it on purpose. It isn’t a “behavior.” It happens naturally. It helps me organize my thoughts and stay on task. It’s the opposite of a distraction. So when I say that a child should be allowed to stim and that stimming is more likely to be cognitively beneficial than distracting, that’s the kind of stimming I’m talking about. Note that in my example, the autistic child was expected to do the things the other typical children were expected to do, such as sitting in their seat and not talking to classmates. They aren’t being allowed to do “whatever they want”–an assumption some people will jump to when anyone raises the notion that autistic children should be allowed to stim. Maybe while they’re sitting in their seat and working on their math problems, they’re also manipulating a piece of string or a fidget toy with one hand. Maybe they’re sitting on an exercise ball so they can gently roll from side to side. Maybe when they pause to think they flap their hands. Imagine the red self-discipline portion of the graph shrinking for these kids when they’re allowed to stim while they work. When that happens, the green “solving math problems” portion can grow. When they no longer have to spend EF resources on not stimming, those resources can be repurposed for learning. If you find it hard to imagine how difficult it is to inhibit stimming for an extended period of time, try this: imagine you have a bad case of poison ivy, you’re not allowed to put any medication on it or to scratch where it itches . . . and I’m going to teach you how to find the limit of a function as x approaches a fixed constant. How much of that math lesson do you think you’ll retain? Would you even care? There is another argument against stimming at school or in other public places: we need to teach autistic kids socially acceptable behavior so other kids/people don’t think they’re weird. Well, I have two things to say about that. 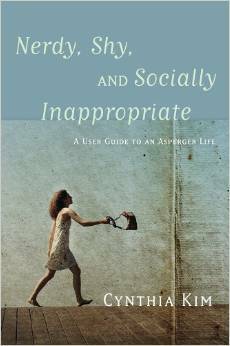 Yes, autistic children should be taught the same social rules as typical children. They should be taught to respect others and all of the rules of politeness and civility that go along with it. But here’s the thing: I was an autistic kid and I can tell you for certain, stimming or not, the other kids already think we’re weird. Instead of insisting that autistic children adopt unnatural behaviors for the sake of social acceptance, how about working toward changing what is socially acceptable? **** I’ve used children as an example throughout this piece, but everything here applies to autistic adults as well.